We’ve all been there. Someone spills something on a rug, couch or floor and the right cleaning product is nowhere in sight. The initial panic is followed by a trip to the grocery store where you find yourself in an endless aisle of cleaning products unsure of which to pick. Bleach may be the best disinfectant but it’s bad for your home. Aerosol sprays may knock out shower grime but they hardly qualify as green. This paradox of choice of disguises the reality of the situation that the best solution is actually making your own cleaning products. Using a few common household staples you can clean basically any mess you can think of and you can do so know that you are not negatively impacting your family, your pets or the planet. We are big fans of DIY cleaners and believe that once you get the hang of mixing these formulas you will not even notice the difference from your old store bought products. 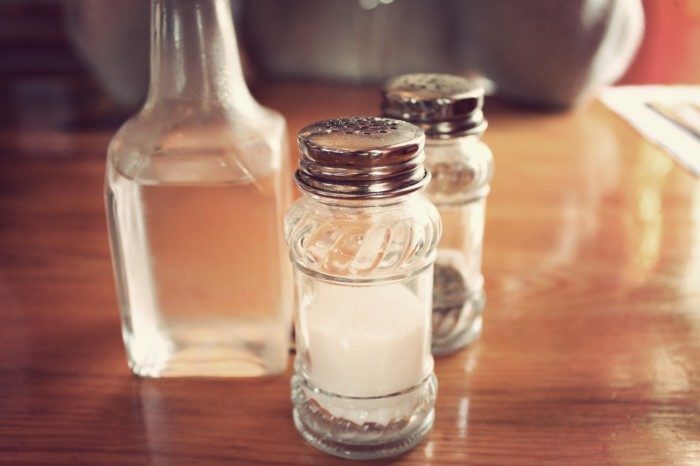 Mix 1 part white vinegar with 15 parts water and pour into a spray bottle. Adding salt to the mixture adds abrasion that helps tackle tougher stains and caked on grime. If you miss the fresh scent of your store brought brand add a squeeze of lemon and your home will smell like fresh in no time. Our old friend white vinegar is the answer again, but this time only dilute slightly with warm water and mop over hardwood for sparkling clean floors. If you can’t bear to part with your Swiffer wet-jet for convenience, try popping the top off and filling it with your homemade solution instead of paying for refills. If you tried using the all-purpose cleaner and areas by the stove are still clinging to remnants of last night’s dinner, take a sponge and dip it in a mix of water and baking soda to tackle caked on grime. Preventative cleaning is also a must in the kitchen. Keep a cloth handy and wipe down counters with water and dish soap after every meal to avoid any unsightly or odorous build-up.